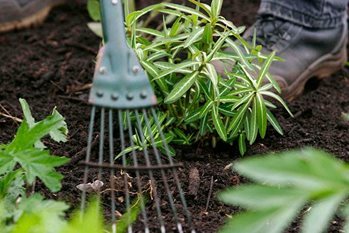 Knowing whether your soil type is clay, sand, silt, loam, peat or chalk will help you choose the right plants for your garden and maintain them in good health. Close up of clay soil pit. Where building or landscaping has mixed up different soils, it can be very difficult to tell what type of soil you have, and it may change markedly over a short distance. The best way to tell what type of soil you have is by touching it and rolling it in your hands. If soil froths when placed in a jar of vinegar, then it contains free calcium carbonate (chalk) or limestone and is lime rich. Another important aspect of soil type, is the pH (acidity or alkalinity). This will also affect the type of plants you can grow and how you manage your soil. Now you know what type of soil you have, you can start to work with it and improve it. Clay soils are rich in nutrients and very fertile if their cloddiness can be broken up by the addition of organic matter. This breaks down the clay into separate crumbs, making the water and nutrients held within the clay more easily available to plant roots. Breaking up the clay into crumbs also makes the soil warmer, more easily workable and less prone to compaction. These light soils are usually low in nutrients, and lose water very quickly being particularly free-draining. You can boost the water and nutrient holding capacity of your soil by adding plenty of organic matter to bind the loose sand into more fertile crumbs. Fertilisers may also be necessary to give plants grown in sandy soils an extra boost. These soils are made up of fine particles that can be easily compacted by treading and use of garden machinery. They are prone to washing away and wind erosion if left exposed to the elements without plant cover. However, they contain more nutrients than sandy soils and hold more water, so tend to be quite fertile. You can bind the silt particles into more stable crumbs by the addition of organic matter. These soils are the gardener’s best friend, being a ‘perfect’ balance of all soil particle types. But even though they are very good soils, it is important to regularly add organic matter, especially if you are digging or cultivating these soils every year. Chalky soils are alkaline, so will not support ericaceous plants that need acid soil conditions. Very chalky soils may contain lumps of visible chalky white stone. Such soils cannot be acidified, and it is better to choose plants that will thrive in alkaline conditions. Many chalky soils are shallow, free-draining and low in fertility, but variations exist, and where there is clay present, nutrient levels may be higher and the water holding capacity greater. Certain soil types are prone to particular problems. Clay soils can suffer drainage problems and may not suit plants that need free draining conditions. Light, sandy soils need a lot of watering.